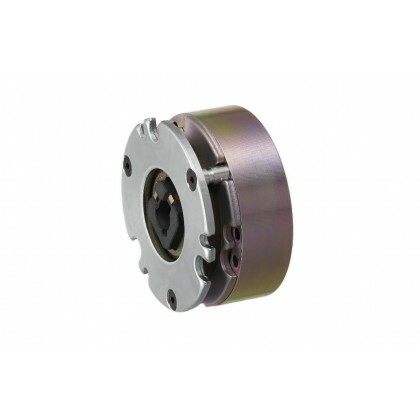 Ideal for emergency braking in power outages and holding position for long periods of time .Essentially spring-actuated brakes comes in two types, braking and holding. The comprehensive range of electromagnetic brakes that are actuated by the force of a spring when the holding electrical current is stopped. They provide excellent performance in emergency braking, holding stopped positions for long periods of time and can prevent machinery from over running. The product group provides advantages such as quiet braking, long service life, high torque from a compact form factor, reliable and stable braking power and manual release. With the BXW safety brake you can choose a holding or braking function. The holding brake offers double the torque of a braking application because of a different friction lining being utilised. The brake is possible to mount on stator side as well on armature side.Another option is to order with and hand release lever. This can be needed if you want to move the axis while there is no electricity. The BXR model is an emergency and holding brake. The thickness is 2/3rd of the older generation. This enables you to save a lot of space and weight by using the BXR model. Another main new feature is the super light weight Rotor with a spline hub. 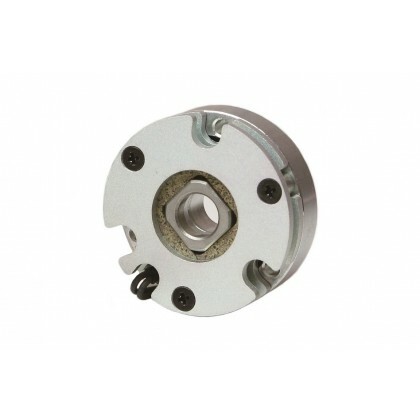 It is made by a stainless steel core and a resin glue to combine friction lining and rotor hub. The resulting low inertia is a big plus factor and also it influences the wear out by horizontal mounting drastically. The brand new design BXR-LE type made a lot of noise in the market. Customers as well the competition has been deeply impressed by the size of this model. With a half thickness and same outer diameter Miki Pulley nearly reaches the existing torques of the big brother type BXW. The maximum thickness is 14.5mm in model 03. With this it fits in nearly every application. The BXL/H series is our standard brake series to full-fill all requirements in the mid torque range. Both brakes are fully set and ready to mount. With Miki Pulleys many years of experience they have been developed step by step over the last years to a unique performance brake proven in various application in all markets. NEWS - Now available through ABSSAC, the brand new BXR-LE type super slim safety brake has an impressive, space saving, physical size. The spring actuated brake model is half the thickness, but same outer diameter, as its big brother type BXW series. It is operated by the compressive force delivered from several built in springs which are activated in the event of a power failure or if the power was cut off due to an emergency. The new model features holding and braking torque just under the existing models, the overall thickness can be as little as 14.0mm in model 035. Through magnetic field analysis and using the latest FEM techniques, the brake has been enabled to have an optimal physical design. Operational costs can also be lowered by using the BXR-LE series. With all safety brakes, when a machine is running, the brake is continuously consuming electrical current, in order to maintain the brake in a released condition. However, the necessary electrical energy consumed when the brake starts to release differs greatly from the current draw requirement when the brake is held in the released condition. By optimising this differential with an over excitation power supply, the operational energy saving can up to 90 % . 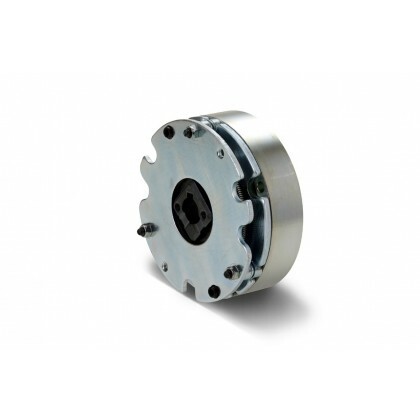 Ideal applications for the BXR-LE brake are in the integrated placement within servo motors and robotics where space saving attributes are maximised. Large BXW models provide a static friction torque of 300 N·m. Securing the rotor hub to the rotor using a disc spring greatly cuts down on backlash. Forming the spline rotor hub of the thin, compact BXR model with an exterior metal plate spring coupling makes it possible to design equipment even more compactly. 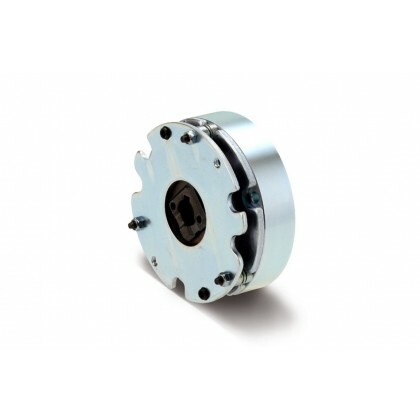 The mounting flange and brake stator can be combined into one single integrated piece. This helps to reduce the number of parts required and cuts down on the amount of space needed. An exclusive made-to-order release lever can be designed to fit the structure of the device. I don't see anything with the torque and response I need in your standard products. Can you customize something for me? We can customize units in many ways: outfitting them for overexcitation power supplies or use of inrush current at motor startup, changing the frictional material, boosting torque, increasing response, extending the total energy (service life), suppressing heat generation, and more. Consult our knowledgable sales engineers on 01386 421 005 for details. Can you handle cases in which standard products cannot be installed due to dimensional constraints? Yes, we can. For example, we have a long track record creating slimmer units that deliver the same torque. 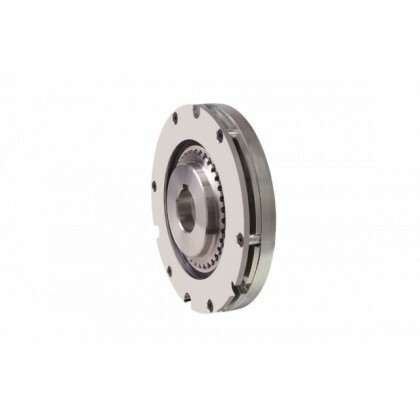 These units can provide the same torque while being only about half as thick as the standard product, although this will vary with your conditions. Consult our knowledgable sales engineers on 01386 421 005 for details. What do you have for dealing with noise issues? Spring-actuated brakes have a number of types of noises, such as (1) rattling generated by microvibrations during rotating, (2) armature pull-in and release noise, (3) friction noise (chirping) during braking, and (4) grinding noise under drive (when the brake is released). We have ways of reducing all of these. The figure below shows an example.